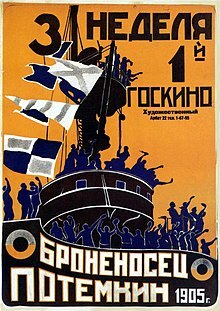 ↑ "Battleship Potemkin by Roger Ebert". （原先內容喺22 November 2010歸檔）. 喺2010-11-28搵到. ↑ "Top Films of All-Time". 喺2010-11-28搵到. ↑ "The 50 Greatest Films of All Time". British Film Institute. Sight & Sound. September 2012. 喺January 1, 2018搵到. "Battleship Potemkin". Senses of Cinema.com. （原先內容喺3 January 2006歸檔）. 喺2006-01-22搵到. Russo-Japanese War Connections> Rebellion or Mutiny on the Potemkin had connection to Russia's defeat in the Russo-Japanese War of 1904-05 - Russian Navy morale was severely damaged.